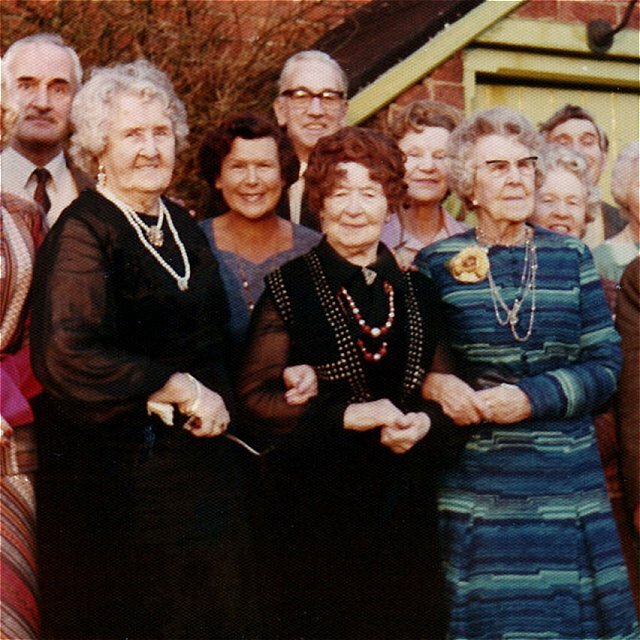 Three long-lived Atcherley sisters are shown here, from left to right they are Ada Mabel Atcherley [ ] (born 1888, died 1991 aged 103), Charlotte Eva Atcherley [ ] (born 1883, died 1982 aged 99) and Hilda Margaret Atcherley [ ] (born 1886, died 1987 aged 100). Ada, who was known as Coey, married Joseph Baxter Shakeshaft (1885 – 1960) on 10 Jun 1912 at Hall Green church in Solihull. You can find out more about this couple and their family at The Shakeshafts website. Charlotte, who was known by her middle name Eva, married Philip Montague Burton in 1920. “Monty” and Eva farmed about 100 acres at Allington in Lincolsnhire. They were still using horses and an old reaper/binder in the early 1950s. Hilda married Seth Sadler (1887 – 1941) on 27 Feb 1915 in the Aston district of Birmingham. Seth was was a design engineer at Dunlop, and the couple lived at 45 Old Chester Road in Castle Bromwich. Their daughter Gertrude can be seen in the photo above in the back row between Coey and Eva. My grateful thanks to Malcolm White for allowing me to use this photograph and for providing some of the information used above.